Austin Independent School District passed a bond to construct a new middle school that would implement 21st Century STEAM (Science, Technology, Engineering, Arts, Math) environments. The challenge was to provide flexible, adaptable furniture in a variety of configurations that would allow multiple teaching and learning styles, as well as incorporating technology and student mobility. STEAM spaces are typically designed with an open, flexible floor plan that include group common areas, collaborative teacher planning areas and blended classroom environments. To focus on the collaborative nature of STEAM work, IJ Holton was designed to allow for flexible spaces - classrooms, community spaces, and furniture that allow for large group, small group and individual work areas to be changed quickly to meet the needs of the moment. The selection process included a collaborative effort between the design team, the school’s administration and staff to select the furniture, fixtures and equipment from Virco’s PlanSCAPE program. 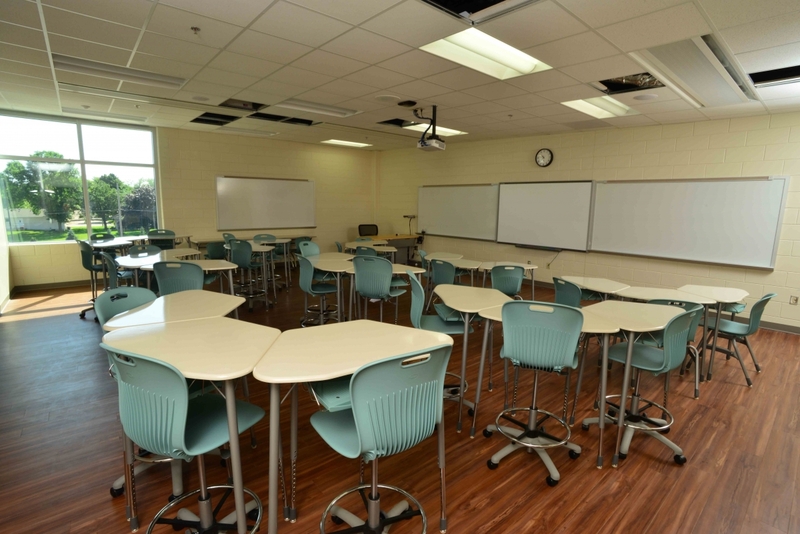 The Virco furniture that IJ Holton integrated into the flexible spaces, such as Sage Task Chairs and Sage Lab Stools, allows for easy movement into groups when needed. Students and teachers can quickly and easily rearrange work spaces by moving furniture in a matter of minutes. The desk top shape of the Zuma ZHEX Student Desk can be arranged into numerous configurations of small groups. Nesting Tables and Stackable Chairs in the science labs were selected for their mobility, flexibility, and versatility. When a teacher needs the lab space for a large group activity, Sage Chairs can be stacked and Tilt Top TEXT Tables can be folded and moved out of the way quickly and easily for the activity, and then returned efficiently for individual or small group work. As seen in the above image, Tiered Classrooms allow for students to have different perspectives and to be contributing participants in large group work. "At IJ Holton Intermediate School, our mission is to create a challenging learning community where students will be engaged in Science, Technology, Engineering, Fine Arts, and Mathematics through an inquiry-based curriculum. Our vision is to build student leaders who will be successful in the 21st Century. We do this by facilitating student learning opportunities that utilize the engineering design process, integrate curriculum that is inquiry based and expose students to the variety of technologies that exists today. An emphasis on design and problem solving in the classroom allows students to use trans-disciplinary tools for discovery and for developing solutions to problems that are open-ended. Such a classroom gives students an understanding of the relationships of all STEAM areas as they are used in the real world beyond the classroom walls. Instead of separating Science, Technology, Engineering, Arts, and Math into individual curriculum "silos," STEAM provides our students with integrative tools of investigation and analysis. Consequently, a STEAM Classroom steers students away from learning isolated facts, to experience-based inquiry with opportunities for independent learning. We are very pleased with the durability and effectiveness of the Virco Furniture used to furnish our STEAM Classrooms. They have been everything we hoped for in providing flexible work space for individual, small group, and whole group collaborative and project work. The service provided by Virco for needs following installation has been exceptional."